Transmission systems are key to delivering security of supply and yet tend to be treated as an afterthought – note for example Germany’s massive deployment of renewables in the north of the country without a corresponding investment in the necessary transmission capacity to deliver it to the demand centres in the south. As noted in my last couple of posts, great emphasis is placed in the UK system on delivering megawatts, with no differentiation between types of generation in terms of flexibility. This article in Utility Week highlights another issue with the current focus on providing capacity – the question of location. The two charts above illustrate the problem. The first chart shows the UK’s consumption pattern with the darkest areas showing the areas of highest consumption (per local authority). 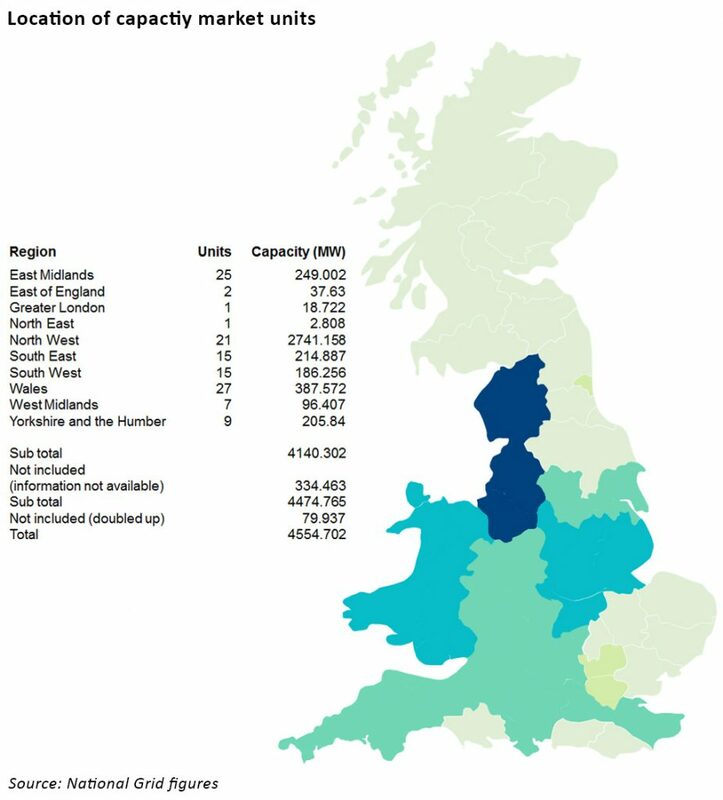 Below is a representation of the location of units that secured contracts in the capacity auctions, with the darkest areas again showing the greatest capacity. A large amount of capacity has been secured in the North West of England, despite that area having relatively low consumption. Transmission issues have become increasingly important, with the associated costs being a significant issue for generators. Scottish Power’s closure of the Longannet plant in Scotland was attributed in part to the high transmission costs it faced. 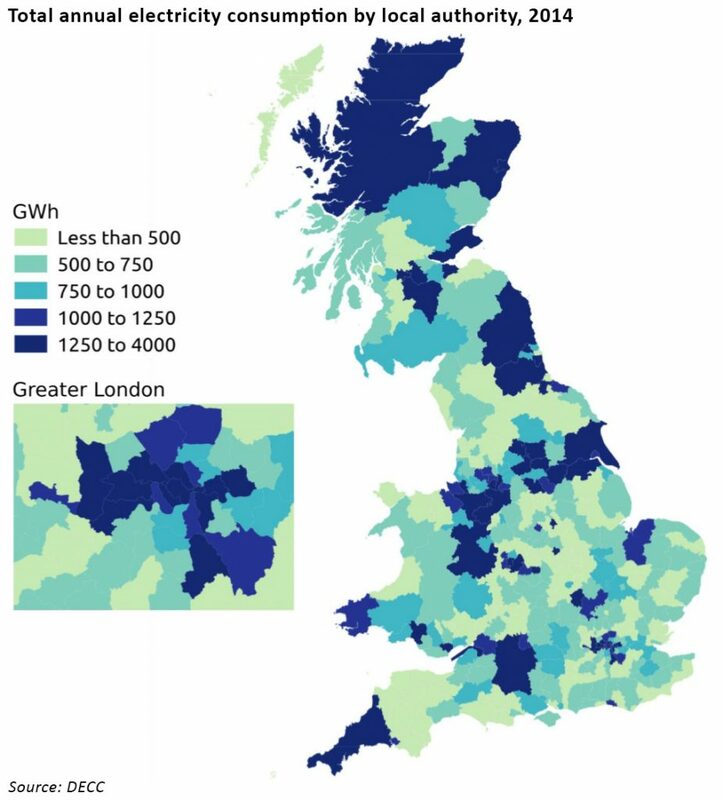 Last year Ofgem looked into the regional differences in network charges and found that consumers in areas where demand exceeds supply, such as in the South East of England, pay higher transmission costs than those in areas where supply exceeds demand, such as Scotland. Historically, this incentivised generators to locate their facilities close to their customers, however renewable generation must be built in areas of high wind/sun, and low public acceptance has largely pushed new wind generation offshore, exacerbating transmission issues. Another feature of the changing generation landscape is that much of the capacity procured in the auctions is connected to distribution rather than transmission networks, enabling the owners to access so-called “embedded benefits” (essentially avoidance of the costs of using and balancing the transmission network). As more generators connect directly to the distribution networks, and as large, particularly coal-fired power stations connected to the NTS close, transmission costs must be recovered from a smaller pool of users, leading to higher transmission costs and increasing the value of the embedded benefits. The extent to which this is occurring has prompted both Ofgem and National Grid to look at the issue, with Ofgem consulting on changes to the embedded benefits regime, and National Grid considering wider changes to transmission charging. Under current market rules, the onus is on National Grid to provide and maintain the transmission capacity required to support security of supply in all parts of the country. With no constraints on the location and type of new generation (from an electricity system perspective – usual local planning rules still apply), transmission planning is increasingly reactive and inefficient. There is a clear role for turndown/turnup demand side response solutions in managing local constraints, but a wider review of the procurement of new capacity is needed if grid infrastructure is to be developed and maintained efficiently. Unfortunately, the recent overhaul of the capacity market rules to incentivise investment in new gas generation means there is little appetite for further review of the scheme – something we may have cause to regret. ← Turndown DSR should be a no-brainer, so what’s holding it back?